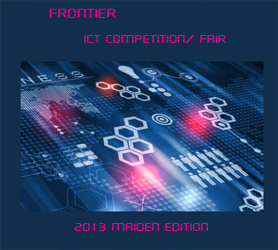 Frontier ICT competition/fair is designed to discover and develop young talents on Information and Communication Technology (ICT) and to promote the teaching of the subject in schools. Highlights include; ICT quiz contest, presentations, ICT fair/exhibitions and award ceremony. The competition which will cover all public secondary schools in the state with the aim of promoting the Teaching and Learning of ICT in schools is organized by Smartrack Digital Security Systems Ltd. with the support of Anambra State Post-Primary Schools Service Commission (PPSSC). Handing over of a brand new laptop computer and certificate to Obinwa Ifeanyi (Idemili South LGA/ Our Lady's Sec. Sch. Nnobi) by the chairman PPSSC Anambra state. Handing over of a brand new desktop computer and certificate to Obaino Miracle (Dunukofia LGA/Saint Mary High Sch. Ifitedunu) by the chairman PPSSC Anambra state. Handing over of a three in one printer and certificate to Chinwuba Samuel (Anambra East LGA/Father Jeo Mem. High Sch. ) by the chairman PPSSC Anambra state.